Individual retirement accounts (IRAs) are attractive long-term savings vehicles, especially given that 35% of private sector workers aged 22 and older don’t have access to 401(k) plans, according to The Pew Charitable Trusts. By paying into an IRA, you are not only making a smart, long-term investment, but you are also benefiting from tax-deferred contributions, meaning you don’t pay taxes on those funds until you make withdrawals in retirement. While investing in IRAs is a financially savvy move, not everyone across the U.S. takes advantage of this strategy in equal measure. Below, we look at data across metro areas nationwide to rank the places investing in IRAs the most. To do this, we looked at three metrics: average IRA payment, percent of tax returns with IRA payments and IRA payments as a percent of income. Check out our data and methodology below to see where we got our data and how we put it together to create our final rankings. Florida is getting ready for retirement - Four Florida metro areas made an appearance in this top 10. Residents in those metro areas tended to contribute a larger-than-average amount of their income to their IRAs. Retirement is not top of mind in Midwest capitals - The bottom-three-ranked metro areas - Indianapolis, Indiana; Des Moines, Iowa; and Columbus, Ohio – are all capitals of their respective states. Our analysis of IRS data shows that the average IRA contribution from the Lancaster, Pennsylvania metro area equaled $4,914 a year. For that metric, Lancaster ranks 26th overall. Meanwhile, 2% of tax returns contained IRA contributions, and IRA payments were equal to 8% of average income. In those metrics, Lancaster ranked 16th and 21st, respectively. The Los Angeles metro area, the second-largest metro area in terms of total number of returns, comes in second. In the LA metro area, the average IRA payment was just north of $5,500, the fifth highest in the study. Along with that, 2.1% of returns came with IRA payments, the 12th most in the study. Los Angeles fell to second, though, because Los Angeles residents’ IRA contributions did not represent as large a portion of their income when compared to Lancaster data. On average, IRA payments only equaled 7.2% of income in the LA metro area. Oxnard, another California metro area, ranked well because residents here who do contribute to their IRAs typically get close to hitting their contribution limit. The average IRA payment here is more than $5,600, the third-highest figure for that metric in the study. With 2.2% of returns reporting IRA contributions, Oxnard ranks eighth for percent of returns with an IRA payment. 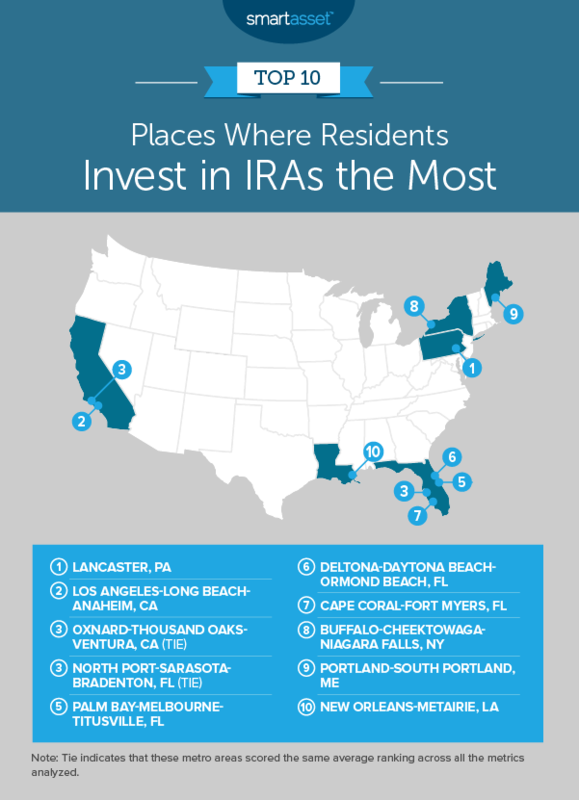 The North Port, Floria metro area ranked well because of the relatively high number of people investing in their IRAs and the average size of their investments. Around 2.1% of North Port tax returns had contributions to an IRA, and the average IRA contribution was greater than $5,400. For both of those metrics, North Port ranks in the top 15. The Palm Bay, Florida metro area secured a top spot because people here, even despite having lower incomes, still managed to contribute to their IRAs. According to our data, IRA contributions here equaled $4,900 on average, which is equal to 8.2% of local income. For that second metric, the Palm Bay metro area ranks fifth. Similar to Palm Bay ranked above, Deltona ranks well because of the large amount of their income that residents allocate to IRA contributions. IRS data shows that the average IRA contribution here is equal to just under $4,800. In terms of overall metro area income, the average IRA contribution was equal to 9.3% of average income. 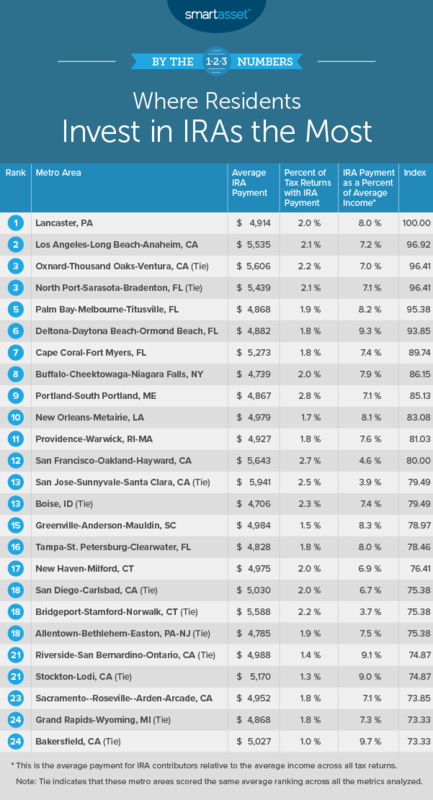 The Cape Coral-Fort Myers metro area, another Florida representative in this top 10, came in seventh thanks to its high average IRA contribution. According to our data, the average tax return that reported contributions to an IRA showed nearly $5,300 in IRA contributions. IRS data also reveals that about 1.8% of tax returns contributed to an IRA. The Buffalo metro area’s highest-ranking metric was the percent of tax returns with IRA payments. Our analysis of IRS data shows that about 2% of tax returns report having made contributions to an IRA. In relative terms, residents here also dedicate large portions of their income to their IRAs. The average IRA contribution is equal to 7.9% of average income. Residents in the Portland, Maine metro area do a great job contributing to their IRAs, according to IRS data. Just under 3% of returns report contributing to an IRA, the most in the study. The average IRA contribution is also fairly large, equalling $4,867. The New Orleans metro area scored in the top 20 for two metrics. Specifically, New Orleans ranked 19th in average IRA contribution at nearly $5,000 and 17th in IRA payments as a percent of overall income. According to IRS data, IRA payments were equal to 8.1% of average income here. Average IRA contribution. This is the total amount of IRA payments made divided by the total number of returns with IRA payments. Percent of returns with IRA payments. This is the number of returns with IRA payments divided by the total number of returns. Average IRA payment as a percent of income. This is average IRA payment divided by average income. First, we ranked each metro area in each metric. Then we found each metro area’s average ranking and gave equal weighting to all metrics. We used this average ranking to create our final score. The metro area with the best average ranking received a 100, while the metro area with the worst average ranking received a 0. Data for all metrics is from 2016 and comes from the IRS. Start early - It is better to start saving early, even if you can’t afford to save much. By saving and investing early, you can unlock the benefits of compound interest. Plus, once you start saving, you develop better financial habits and make saving in the future less of a chore. Ask an expert - Whether you are just about to retire and need to make sure your assets are in line or are making a plan to save for retirement, you can’t beat the help of an expert. If you are not sure where to get your own financial advisor, check out SmartAsset’s financial advisor matching tool. We can pair you with up to three financial advisors in your area who can best meet your financial needs.